When I first rigged up the Hebridean wind vane self-steering, I used some hard anodized aluminium rings instead of blocks to run the tiller control lines. These rings are mechanically simple and very slippery, and they’ve done a great job. A couple of years ago I started to think about where else I could apply them. Tammy Norie has “sister blocks” in the main sheet to evenly distribute load across battens. 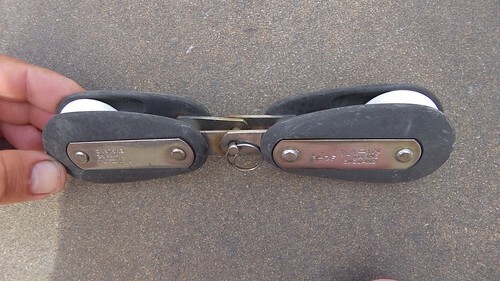 These are simply two blocks attached back-to-back. There’s nothing wrong with this, and Tammy’s are in good condition, but I wondered if something simpler and lighter could be made from anodized rings. And here it is: the “sister rings”! This is such a simple idea that I can’t believe someone hasn’t done it before. 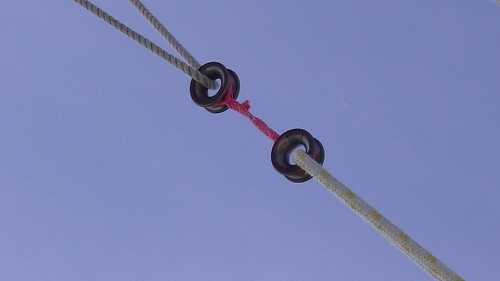 It’s just two rings joined together with a double eye splice. In this case, two 16mm Barton “high load eyes” joined with Dyneema. This is a simple, lightweight, cheap, strong, and easy-to-make alternative to sister blocks, with comparable friction, unlike the traditional wooden euphroe. 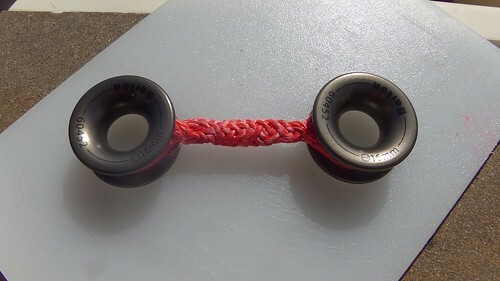 To form the splice using single-braided line (such as Dyneema), form two eyes like this. 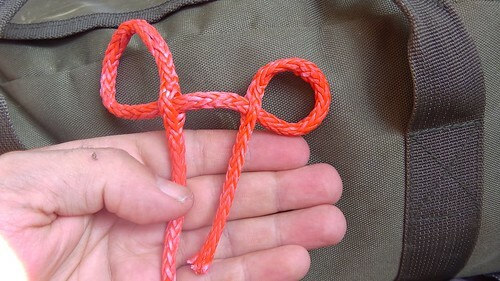 Note that the long end passes through the short end (the opposite to what you might expect) and this involves passing one of the eyes through the braid. Once you have the rings in place and have tightened the eyes, trim and tuck the ends inside the braid between the rings, fixing the eyes. I use Selma fids for this kind of splicing. I’m experimenting with using these rings to replace blocks in other parts of the rigging. It’s easy to carry rings and line and make up or repair things that you need on board, and that very much fits with my philosophy for Tammy Norie! There’s plenty more to show for another time. Let me know if you have anything you particularly want to see or know about.